Blue handmade knitted one size sweater for special woman! Blue or other color trendy knitted sweater looks amazing in different occasions. 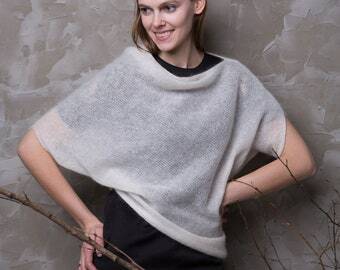 The most important - you will look special with this super soft, light and warm mohair tunic. 1. You will love to wear it with shorts at not so warm summer evenings. 2. You will love to wear it with jeans and sneakers. 3. You will love to wear it with jeans and high heels. 4. You will love to wear it with skirts. 5. You will love to wear it like a top on your dress. Moreover, I wear it during all seasons (Summer, Autumn, Winter, Spring).